Microsoft has been accused of spying on users on the pretext of enhancing customer service experience since the days of Windows 7 & 8 and carried forward the same practice to the latest Windows 10 OS as well. 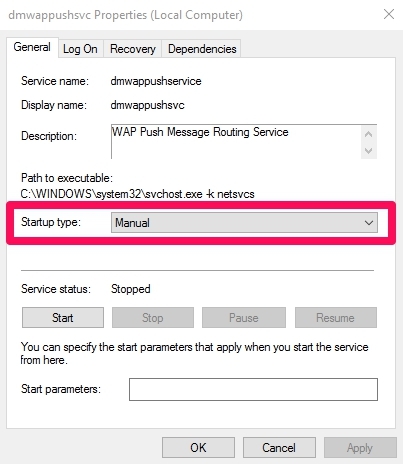 The Telemetry feature that is enabled by default on Windows PC gathers data about user actions and delivers it to Microsoft. When you fresh install new Windows 10 there is no way of circumventing Send Your Device Data to Microsoft message, though you can control the extent to which data can be shared with Microsoft from Settings menu as we will show you in this post. However, there is a way of blocking/disabling the feature that sends device data to Microsoft on Windows 10. Telemetry feature as we said earlier is enabled by default on Windows 10 Home, Pro & Enterprise edition, you can restrict the amount of data that Microsoft can collect through Telemetry on Windows 10 PC/laptops from Settings menu. Telemetry sends data about your PC usage to Microsoft that enables the company to gauge what features users prefer most and how to further improve its services in future. Microsoft guarantees complete security of the user data but this can be intrusive, no-one likes being spied on, therefore its better to take matters in your own hands. 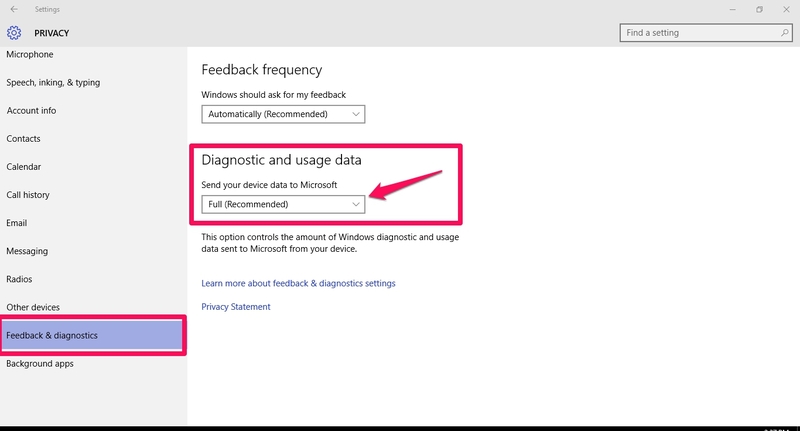 Click on Windows Start Button > Settings > Privacy > Feedback & diagnostics . On the Right Settings Window pane you will see a box under the option Diagnostic and User Data that has three options Basic, Enhanced and Full (Recommended) as to the level of data that Microsoft can collect from your Windows PC. Basic – When you select the Basic option under Diagnostics and User Data option, it will allow Microsoft to collect basic information regarding apps/software installed, Windows stability and PC’s day-to-day functioning with Windows OS. Your Personal data and information isn’t shared with this option. Enhanced – This option shares all features of Basic option and your personal habits as to the Windows usage patterns, information about your most liked features on Windows by tracking how often you use/click on particular feature, what apps you use mostly for work or entertainment purposes, information about software/app crashes including memory/PC hardware status at that point in time. Full (Recommended) – Third option gives Microsoft the right to collect extensive user data. It shares all features of Basic & Enhanced options plus data about apps you are currently working on, memory prototypes, system registry and files information. Although Microsoft contends that all information gathered via Full (Recommended) option is safe and won’t be shared with advertisers but still enable this option only when you are fully confident as to data security. 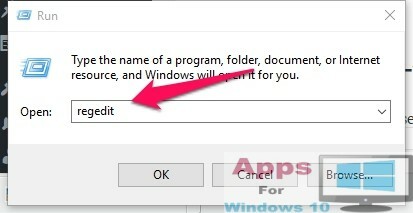 Above mentioned method minimizes the level of data sharing from your PC to Microsoft but it doesn’t completely disable device data sharing to Microsoft on Windows 10, for that see the guide below. Follow step-by-step instructions for preventing Microsoft from collecting data from Windows 10 devices altogether. 1 – Open Windows Registry Editor by Right-clicking start button and select run from the list. Type regedit in the Run window and hit OK.
3 – On the right window pane right-click on an empty space and go to new > DWORD (32-bit) Value name the file created AllowTelemetry and right-click on it to select modify from drop-down box. Set value data to 0 and click OK and close Registry Editor. 4 – Now click start button again and right-click on File Explorer option then place the mouse pointer on more to click the option manage from the drop-down menu. 5 – A new window named computer management will open. Click Services and Applications and then Services. 6 – From the list of Services, double-click ‘dmwappushsvc’ and ‘Diagnotics Tracking Services‘. In the general tab click the drop-down menu next to the option startup type and select the option disable from the list and click OK button. Hit enter after typing the command and close PowerShell Window once its done. 8 – Now Restart the PC for saving changes to system settings. All done. ‘Send data to Microsoft’ option should be completely disabled on your Windows 10 PC & laptops after the above mentioned tricks & tips.